My short fiction has appeared in numerous publications, including, American Atheist, Jewish Currents, Snicker, Potpourri, 3:am Magazine ("The Ugly Green Bug") and was featured by the Beverly Hills Library's New Short Fiction reading series ("Zombie's from the Vast Wasteland"). During my recovery, my friends on Friends of the Mountain Dulcimer (FOTMD) and Facebook have been cheering me on through my many ups and downs. I can't tell you how pleased I am that my perseverance and emotional strength throughout these struggles has been inspirational for so many of them, but I wouldn't have been able to get through this without their encouraging posts and innumerable virtual hugs. Their support has been just as inspirational to me. Along the way, I've left a trail of cyberspace bread crumbs worthy of Hansel and Gretel. 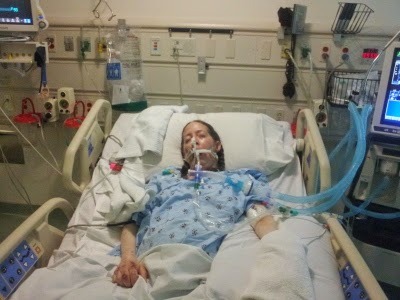 It started with a blog Keith posted on FOTMD after I fell into a deep coma: Geekling Status Update, when it looked like I was unlikely to survive. Next came the thread that Carrie Barnes started to cheer me up in the nursing home after, against all odds, I awoke from the coma with all my mental faculties intact: Greeting for Geekling. (Note: The most interesting parts are near the beginning, when I was was taking my first steps and finally being allowed to eat food.) This blog contains my first posts after the awakening, when I could barely hold the stylus in my hand to peck out the words one letter at a time. I find the countless typos rather amusing, since I'm such a perfectionist. As my strength grew, I started my own thread that became a blog of my continuing recovery: Gadding about with Geekling. The thread features many photos Keith took on our garden walks to improve my walking. At first, a four-wheeled rollator was too challenging for me. 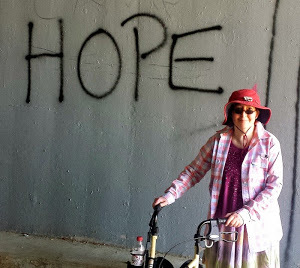 Later, when I was stable enough to keep the rollator from rolling away from me, I graduated from the two-wheeled walker I had been using, which allowed me to walk much farther. The pictures are another kind of log of my physical progress. The prednisone I was taking for my autoimmune disease, dermatomyositis (DM), weakened my immune system and caused me to come down with Legionnaires' disease, which is what made me to fall into the coma in the first place. But when I wrote this blog about how I diagnosed my DM via Dr. Google, prednisone was still a godsend, since I had already sustained a great deal of muscle damage from the DM: I won the lottery, but what I got was no prize. Fortunately, my DM went into remission while I was in the coma. I'm stepping down from prednisone now, and I will soon be able to discontinue it completely. Besides the coma, prednisone has also given me severe osteoporosis. Before the advent of prednisone, DM was often fatal, but talk about double-edged swords! 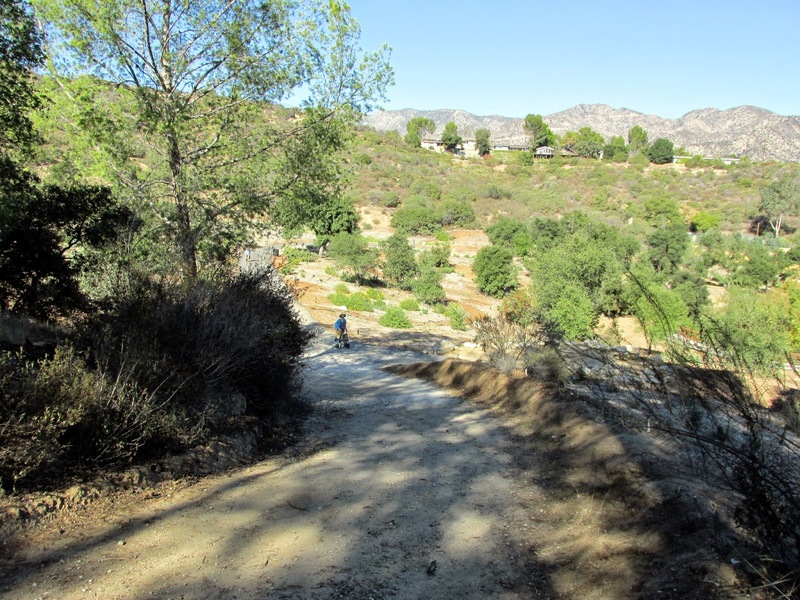 Last Sunday, we went to the Descanso Gardens' new Oak Woodland section for our weekly rehab walk. As you can see, it has a number of steep sections, but there are no benches where you can rest. It's new, and maybe they depend on the donations of members to pay for their benches. 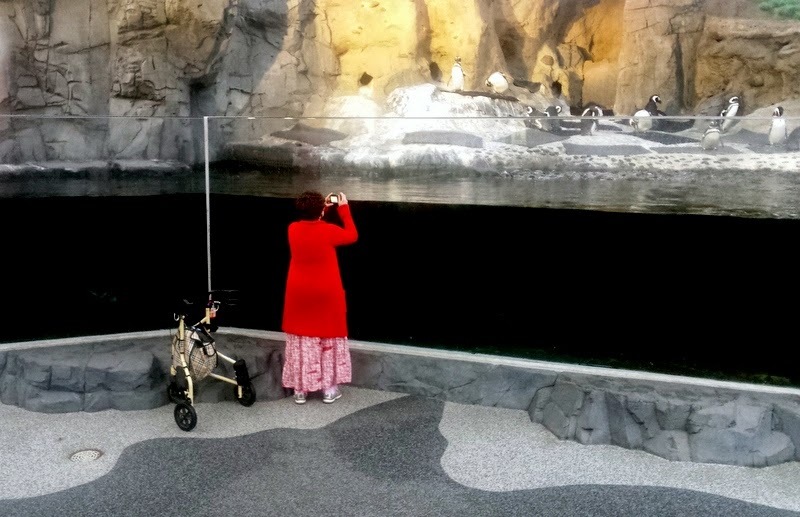 Perhaps the next time we go, we'll bring the big rollator with a seat. I prefer the small, three-wheeled rollator, which is lighter and more maneuverable, but the seat on the bigger one does come in handy sometimes. There are some additional pictures Keith took on my Tumblr blog. I flopped over and hit my head the first time I tried sitting up unsupported long enough to be transported into a wheelchair. 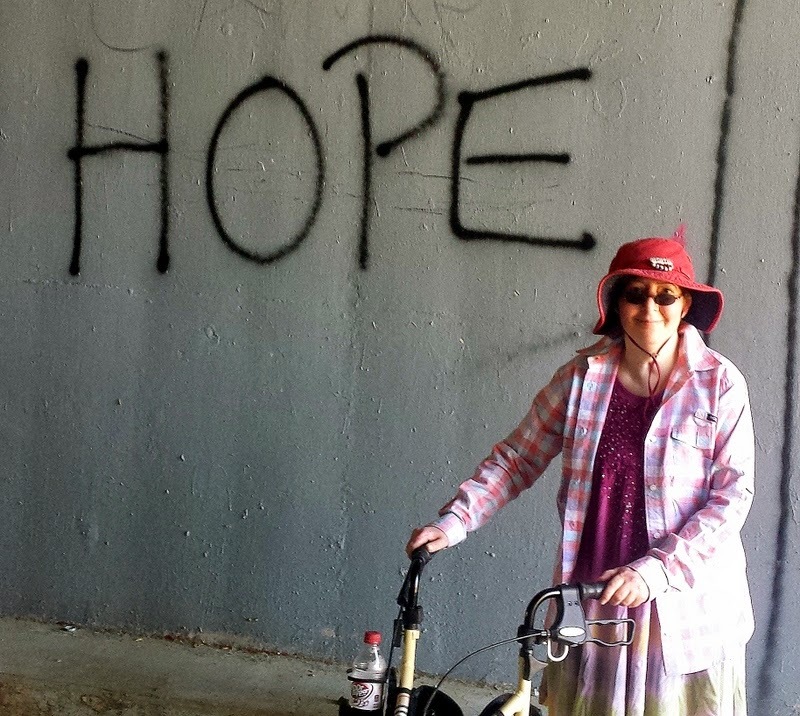 I was in a nursing home, recovering from my 6-week coma. I couldn't stand even when I was being held up. Physical therapists put me in a device that resembled a giant vertical sandwich press. My legs were the sandwich. The pressure was supposed to aid my standing. It didn't. They kept increasing the pressure until I yelled--UNCLE! Still, I couldn't stand. 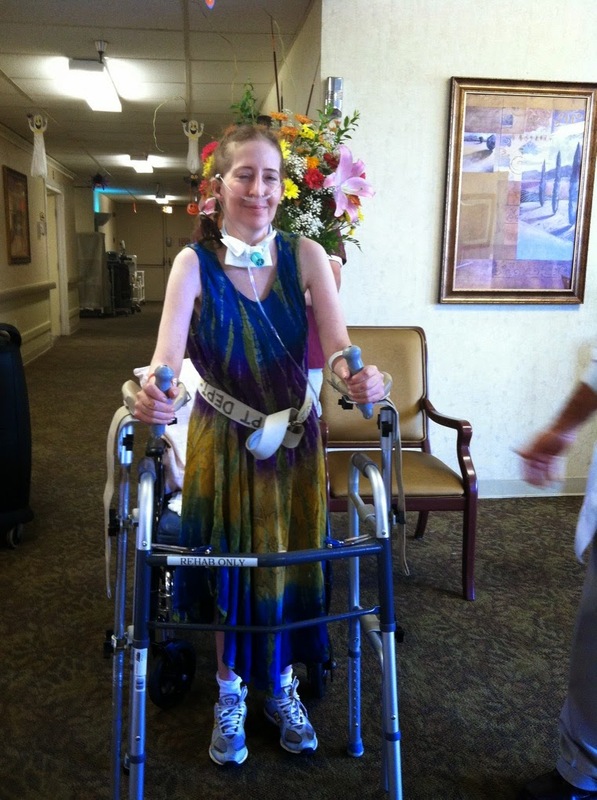 It looked hopeless, but eventually I was able to stand with a special walker that braced my arms (see above). At first, I had to throw my arms at the arm braces and hope I could catch it. Before long, I could very slightly edge my feet forward. They called those steps. Soon, I was able to take a couple of actual stiff, Frankenstein-like steps. John Silva was the main therapist who helped me to walk again, Another physical therapist scoffed that I wasn't really walking because he was holding me up as I walked. Later, after I was walking without support, other therapists thought he was pushing me too fast. But it worked. 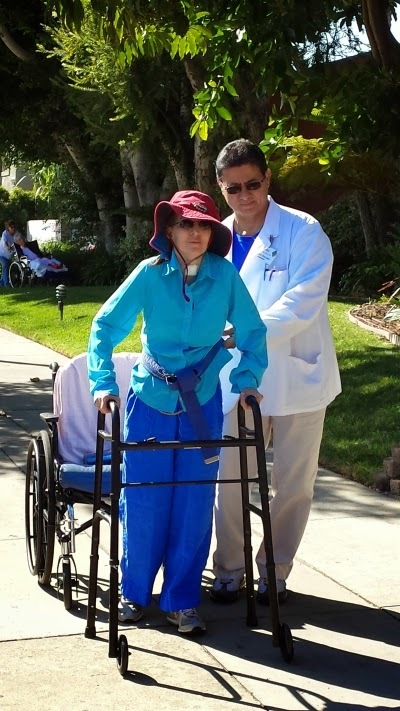 He was using the techniques he learned at Rancho Los Amigos National Rehabilitation Center, which he said was nationally recognized for its innovative approaches, and for that I'm eternally grateful. Without his help, I wouldn't have made it home in time to save my Kaiser health insurance, which would've been canceled if I had stayed in the nursing home past last November 1st. If they made a movie about him, he would be the maverick defying his hidebound colleagues to save a patient without a chance. This is a picture taken with John the first time I walked outside the nursing home, which was his method for helping patients progress. That made one of the therapists practically roll her eyes. By the way, he wasn't holding onto me, just grasping a belt around my waist, which was a required safety measure. And here is the video I made using pictures my boyfriend Keith took on our garden walks, which I started at the suggestion of the outpatient physical therapist I saw when I returned home, Alan Lee. The walks have greatly improved my walking, so I owe a debt of gratitude to him, as well. The video features my playing of "Morning Has Broken" on a vintage Folk Roots mountain dulcimer as its soundtrack. I posted it on the day after my birthday, both to celebrate my rebirth after nearly dying and to thank my dulcimer-playing friends for their emotional support through my difficult recovery. While vacationing in Sicily, I came down with Legionnaires' disease, which is a (usually) rare form of severe pneumonia, though I've had the misfortune of catching it twice. In both instances, it was due to the immunosuppressive effects of medications I've been taking for an even rarer autoimmune disease called dermatomyositis (DM). I began getting sick in the waning days of our vacation, but I had written off my hacking cough as a nasty cold. Call it Mussolini’s Revenge. A few days after we got back, however, my boyfriend had to rush me to the emergency room. I was in such a mentally altered state that when he asked me why I hadn't turned on the air conditioner, I said that I liked the heat. It was 105, and I hate the heat. The Legionaires' disease caused me to develop a severe case of septic shock. 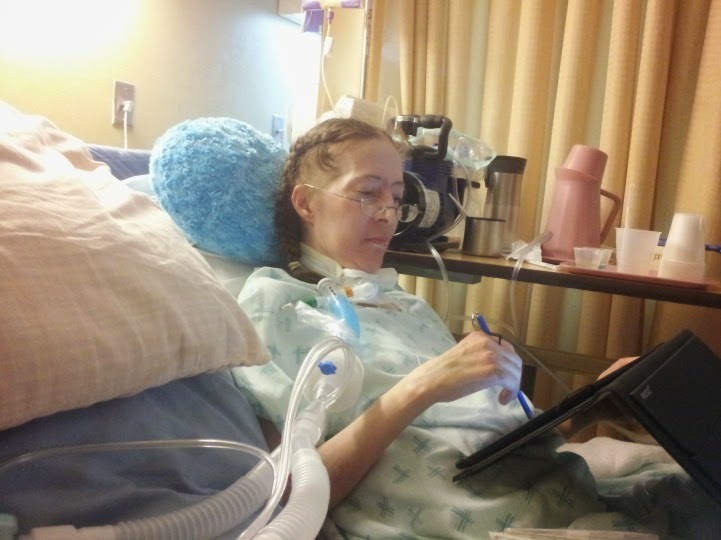 The sepsis made my blood pressure plummet, causing a series of strokes on both sides of my brain. I fell into a deep coma. When the doctors saw the stroke damage on my MRI they concluded that I was a hopeless vegetable. Indeed, they didn't even perform a Glasgow Coma Scale test on me, and it's just a low-tech behavioral check list. But I was still conscious. 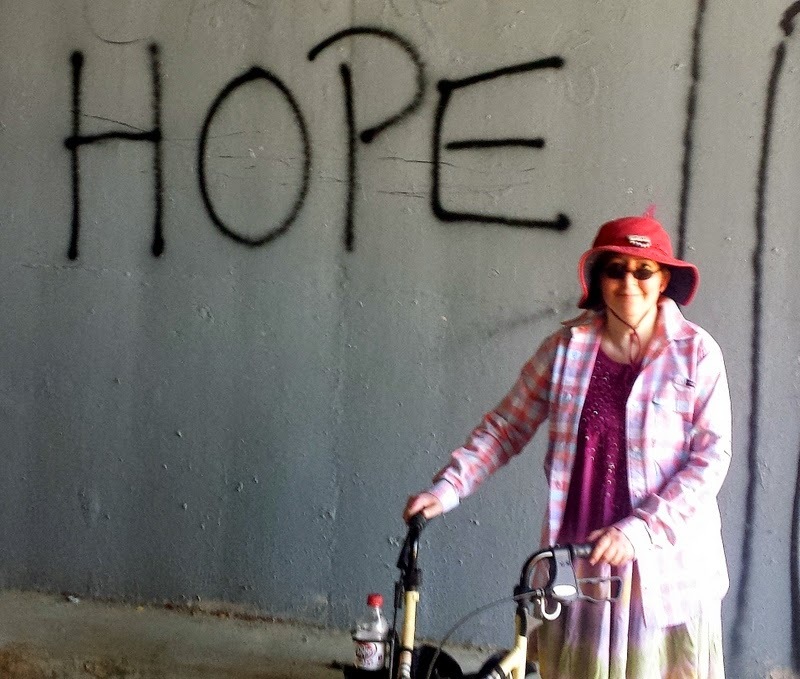 I was, as a British vegetative-state survivor, Kate Bainbridge, put it,"in there." I had what is known as covert cognition. When the doctors shined lights in my eyes looking for signs of consciousness, I was telling them grumpily, "Leave me alone. I'm trying to get back to sleep!" Unfortunately, I was snapping at them that in my coma-dream. They took my lack of response in the real world as confirmation that I was completely unaware. My research has shown that there is increasing scientific evidence of covert cognition in as many as many as one in five people with disorders of consciousness. I was in a state of the art hospital. I think it's an outrage that more isn't done to evaluate and help those one in five patients that are "in there." Kate Bainbridge was the first person pioneering researcher Dr. Adrian Owen scanned with Positron Emission Tomography. She was the one who made the "in there" comment, in a note to Dr. Owen. After her PET scan detected her covert cognition, she received therapy that eventually helped her awaken from her persistent vegetative state (PVS). My doctors said that any form or stimulation or physical therapy would be futile. I was fortunate enough to wake up on my own, anyway. Sadly, Kate is now severely disabled due to the nature of her brain damage, though her cognitive function is fully intact. Six weeks later, I woke up from the coma. I was so deconditioned that I could barely lift my head. Through intensive physical therapy, I've made a great deal of progress, but I'm still not back to where I was before the coma. And I continue to experience weakness in my arms and legs, which were damaged by my DM. It has been a hard road back, but it has been made harder by the six weeks of complete immobility. My strokes cause little physical damage. Almost all of my problems were due to the coma itself. If I had received medically supervised stimulation, I could've had a shorter recovery. I might even have woken up sooner. That's what happened with Kate after Dr. Owen discovered that she was still aware. Dr. Owen has communicated with a number of other patients with disorders of consciousness using functional magnetic resonance machines (fMRI). FMRI machines are expensive and aren't mobile, so he's devising ways to use electroencephalograms (EEGs) to detect covert cognition. In fact, they recently published a paper that showed some success in this endeavor. Perhaps they'll succeed in getting patients to communicate with EEGs, as well. 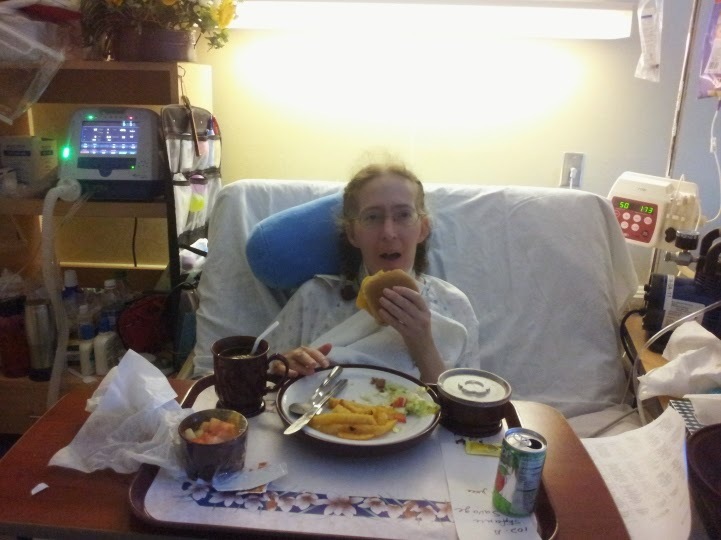 I was given an EEG after my strokes. I wouldn't be able to write this if I were brain dead (except in the morning), so you won't be surprised to learn that they detected brain activity. Unfortunately, the EEG, at least as it's now performed, couldn't detect that I was experiencing a rich "coma-dream," as I call it. The coma-dream was my skeptic version of a near-death experience. Instead of seeing spirits, I saw miniature zoo animals having a tea party--like poker-playing dogs, only with tiny china cups. The elephant held the teapot with its trunk. The revolving segments of my coma-dream were often interrupted by the things my loved ones were saying, reading, or playing for me to stimulate my recovering brain. The doctors, however, continued to dismiss the signs of my increasing awareness. I worry, as Kate Bainbridge does, that people are having their plugs pulled because doctors are telling their loved one, as mine did, to give up all hope for their full recovery. How many of them are in there too? Here is a link to Western University's website about their Brain and Mind Institute, which is headed by Dr. Owen: The Owen Lab. The website has a huge amount of information about the lab team's covert cognition experiments. There are also links to videos about Kate's story. It's well worth checking out.